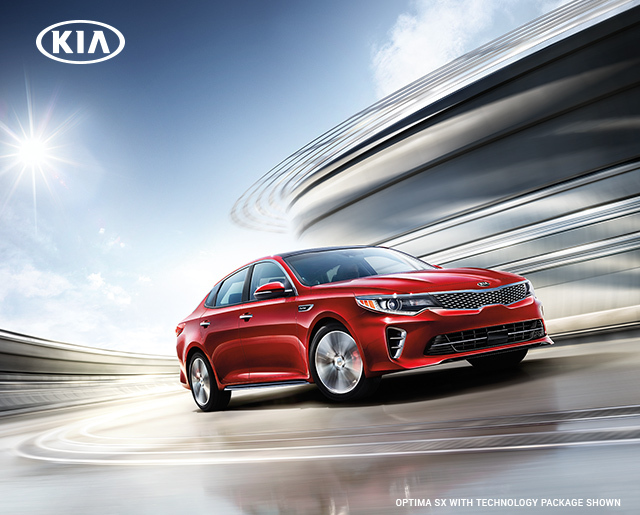 We truly appreciate your interest in our Kia Optima and hope you'll still visit a Kia dealer to get behind the wheel. 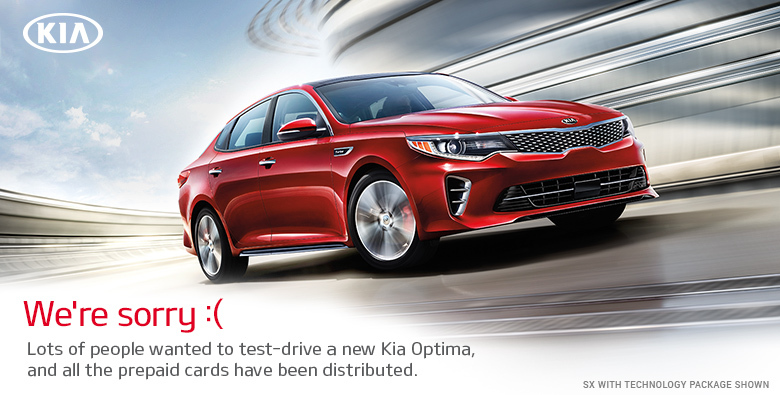 In the meantime, learn more about Optima, Optima Hybrid or the entire 2016 Kia lineup. Test-drive offer is valid from July 29th to December 31st, 2016. To be eligible, test-driver must be 18 years of age or older with a valid driver's license. This offer is non-negotiable and non-transferable. One $25 Kia Visa® Prepaid Card per household. Test-drive and Kia dealer salesperson validation required. Only the completed certificate with an original Kia dealer salesperson signature and unique Personal Priority Code will be honored. Your envelope with the original, completed certificate inside must be postmarked by 01/15/2017. All matters of program eligibility and qualification will be conclusively resolved by Kia Motors America, Inc., in its sole discretion. Offer valid only in the continental United states including Hawaii and Alaska. Void where prohibited by law. Offer limited to first 10,000 completed certificates received, valid while supplies last. Kia is not responsible for mistakes or typographical errors. Kia is not responsible for lost or misdelivered mail. Kia's liability is limited to the value of the Visa® Prepaid Card. Your Visa® Prepaid Card is issued by MetaBank™ pursuant to a license from Visa® U.S.A. Inc. For comments or questions, please call 1-877-883-4913. © 2019 Kia Motors America, Inc., 111 Peters Canyon Road, Irvine, CA 92606.